The stupid things I’ve done were done sincerely. I thought I was helping. It’s possible to sincerely believe you’re being helpful when you’re doing harm. Smart leaders do stupid things. When leaders tolerate out-dated unnecessary rules that make work more difficult, they lack common sense. #1. Stupid seemed smart. Stupid rules had good reasons. Over-caution seems smart, but it’s stupid in changing or turbulent environments. Smart is time specific. #2. Smart turns stupid when circumstances change. Smart is situation specific. #3. Power, authority, and position seduce you into thinking you’re smarter than others. The chair at the head of the table doesn’t increase your smarts. It may make you dumb. Better to think you’re stupid when you’re smart than to think you’re smart when you’re stupid. When you believe something is true – when it isn’t – you end up doing stupid things. #1. Identify. 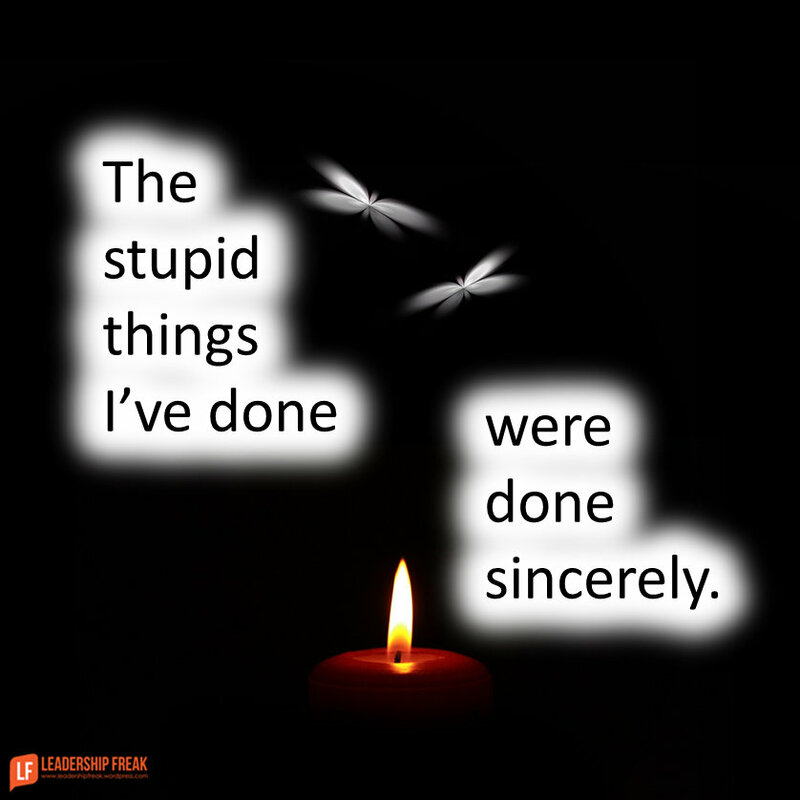 What stupid behaviors are happening in your organization? Where is the sand in the machine? Rob Galford, co-author of Simple Sabotage, asks leaders to discuss the stupidest rule they have. He indicates they quickly come up with stupid rules. #2. Calibrate. What is the range of acceptable behaviors? Embrace common sense. #3. Remediate. Give people the right to call out the behavior or protect against it. #4. Innoculate. Create a system where you measure behaviors and prevent stupid rules. Why do smart leaders do dumb things? How might leaders protect their organization against stupid rules? Bob Frisch is co-author of Simple Sabotage. I’ve had loads of fun reading this useful book. Wow! May I forward this post to Congress and other governmental agencies? Thanks Dianna. Perhaps one of our greatest challenges is applying this to ourselves. I’m not sure forwarding would help. Just as it’s hard to admit mistakes, it’s equally hard to call out rules as stupid. Leaders need the courage to admit they are wrong, that their ideas have run their course and new ones are needed. We can’t improve (ourselves, our business, our organization) unless we admit something has to change. Stupid rules is a great place to start. Rules are easy to change and change again. Thanks Susan. “Rules are easy to change and change again.” I love the “and change again,” at the end of your comment. Bingo. Too often that strict past policy was created because of one person’s bad mistake when the answer could have instead been to offer better training or reposition the employee in question. Thanks James. Your comment reaches back to the source of some stupid rules. One person does something stupid and everyone becomes subject to a stupid rule. In this case, conversations are better than rules. The risk that the mistake will happen again is less than the detrimental effect of stupid rules. These sorts of rules can beput put in place for many reasons. Two very bad ones follow. Many organisations have realised that people who can apply intelligence, discretion and judgement to situations tend to require rather more in the way of challenges and interest to keep them working effectively. Proactive, rather than reactive, people require a greater stimulus, and also tend to need to be paid somewhat more to retain them. By they having simple rules and SOPs, and din into their staff a mindset of slavish obedience to those rules, they can employ more modestly capable staff, at a lower cost. Second, many times strict rules that do not allow for discretion, discernment and judgement are regarded as a safer system if any kind of litigation might occur. Blindly following a system of rules is regarded as more defensible than having to explain exactly what qualifies someone to exercise judgement! The common model is to have the minimum number of intelligent, discerning people to deal witht the problems that cannot be resolved by a simple “the computer says no” approach. Provide everyone else with a simple “if X, do Y” SOP to follow and tell them they don’t need to know any more. Many organisations use this management model, without ever realising that a bit less management and a bit more leadership, including thinking WHY a few times might cost them a couple of quid, but in the long run it might save the whole business! Often, stupid rules are made in less-than-thoughtful response to a specific person’s mistake or lapse of judgement in a situation that might occur once in fifty years, but the rule itself hampers the efficiency and effectiveness of nearly everyone, all the time. Many managers find it easier to make more rules than to deal with individuals and situations (in other words, to lead). I’ve often heard the justification, “You can never be too careful” in having enough rules. But, yes, you can. It seems that it’s a matter of overly controlling leaders (really, not leaders in practice at least; they are managers and not good doing that either) or leaders who don’t feel they have the time to explore things with others. Love the four stages. I don’t like ‘stupid behaviors’ in stage one; it’s ‘questionable behaviors’ until the discussions of stage two – for me at least. For me, there are certainly stupid rules and behaviors. But through transparency and meaningful expectations of full discussion, the ongoing interpretation of ‘stupid’ will be valid and the determination of which rules and behaviors fit that interpretation and needs to be dealt with. Starting with YOURSELF rather than forwarding this to others is a perfect example…too many times as leaders we fear that letting go or admitting that something we created is now stupid is somehow a sign of weakness, when indeed it can be a strength, modeling continuous improvement of self and organization. I think that this should be on every CEOs performance scorecard! Such a timely post. “When leaders tolerate out-dated unnecessary rules that make work more difficult, they lack common sense.” As a leader responsible for quality systems, I see too many times where initiatives are taken to address a short-term issue, only to see those initiatives go on forever, even after the short-term issue is gone. We can get into the habit of adding to our processes and standards time after time, and never going back to see if those things are still needed. It creates unbelievable bureaucracy and makes our teams inefficient, and worse frustrates the workplace.